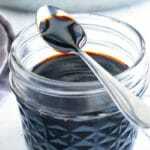 Learn how easy it is to make a balsamic reduction at home with only ONE ingredient! This balsamic glaze recipe tastes incredible on a caprese salad, pork, or atop a crusty piece of bruschetta. Add balsamic vinegar (and sweetener) to a medium-sized saucepan. Bring ingredients to a boil and then reduce heat to a simmer. Simmer uncovered for 12-15 minutes, or until balsamic vinegar has reduced by ½ to ⅔. Simmer longer for a thicker glaze and shorter for a thinner glaze. Let balsamic reduction come to room temperature before storing in an airtight container. Enjoy! Serving size is for 2 teaspoons of balsamic reduction without added sweetener. Store the balsamic glaze in an airtight container at room temperature for up to 1 week or in the refrigerator for 1-2 months.